The California Department of Water Resources says the cost of the Oroville Dam spillway disaster -- the combined price tag for the emergency response, debris removal and rehabilitating the shattered main spillway structure and adjoining emergency overflow channel -- has hit $1.1 billion. Wednesday's announcement, made during a telephone media briefing, is the second time this year that the reported cost of the spillway incident has jumped by 25 percent or more. In January, DWR estimated the project cost at $870 million. The department's original estimate for the cost of the February 2017 spillway failure and its aftermath -- a guess made before the rapid erosion of the emergency spillway prompted the evacuation of about 188,000 people from communities along the Feather River below the dam -- was between $100 million and $200 million. The agency said the estimated cost of construction has risen from $500 million to $630 million. The estimate for related cleanup work, including agency staff time and future cleanup and restoration of the massive job site, has risen from $210 million to $310 million. The rest of the price tag -- $160 million -- is for the initial emergency response and remains unchanged from earlier this year. DWR spokeswoman Erin Mellon said during Wednesday's briefing that the $130 million in increased construction costs is due to the need for additional crews to help rebuild the main spillway by Nov. 1 and for work to limit erosion in the adjoining emergency spillway if it overflows again. To protect the emergency spillway -- a tree- and brush-covered hillside below a quarter-mile-long concrete weir -- engineers have devised a massive concrete splash pad and "cutoff wall." Water would pour down the splash pad and down a long series of steps -- designed to dissipate the energy of flowing water -- before reaching the unpaved portion of the hillside. The cutoff wall, consisting of piles embedded up to 65 feet into the slope, is intended to stop erosion from working its way up the slope and endangering the overflow weir. It was that kind of "head-cutting" erosion -- which the DWR and some outside experts had earlier dismissed as a serious possibility -- that dam managers feared could lead to an uncontrolled release of water and prompted the Feb. 12, 2017, evacuation orders. 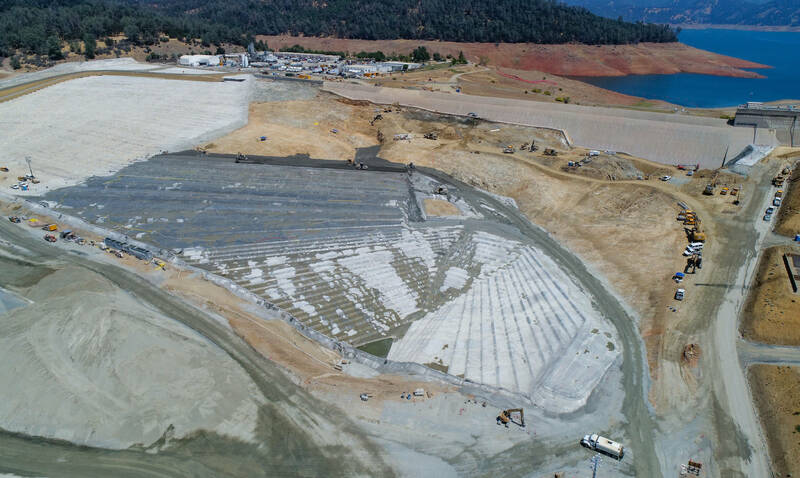 Mellon said Wednesday that crews working for general contractor Kiewit Infrastructure West have needed to do more extensive excavation in the emergency spillway than first anticipated to reach rock sound enough to use as a foundation for the splashpad. The extra work to get down to competent rock, along with the need for additional material to build the splashpad, was a major factor in the increased costs, Mellon said. The department says it continues to submit project expenditures to the Federal Emergency Management Agency, which may reimburse up to 75 percent of the costs. DWR reported in January that FEMA had reimbursed the state for $87.4 million -- exactly 75 percent -- of the first $116.5 million in spending the agency submitted. No further FEMA payments have been forthcoming. Asked by a reporter Wednesday whether it was fair to say full federal reimbursement would be a "long and involved" process, Mellon replied, "Yes." Oroville Dam and Lake Oroville are the principal facilities of the State Water Project. DWR has said that the State Water Contractors, the 28 urban and farm water agencies that get their supplies from the project, are expected to pay for costs not covered by FEMA.